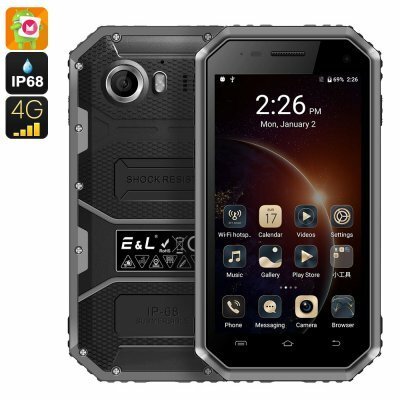 Successfully Added Ken Xin Da W6 Rugged Smartphone - IP68, Dual SIM, 4G, Quad Core CPU, Shock Proof, Android 6.0 (Black) to your Shopping Cart. The Ken Xin Da W6 is part of the companies new flattop series and is made to withstand all the world can throw at it - besides bullets of course. With its IP68 rating the phone is fully waterproof and can be submerged in water of depths greater than a meter without any ill effects. Its also full impervious to dust ingress and comes with a hardened outer plastic case that makes it shock proof. Having been subject to endless torture that would probably end most Smartphone's the Ken Xin Da W6 emerged unscathed proving its got what it takes to withstand even the harshest of environments and clumsiest users. With its Quad Core CPU, 1GB RAM the Ken Xin Da W6 has all the functionality you require from a Smartphone. The efficient Android 6.0 Os was specifically designed to work well with such systems and is able to utilize the resources available for multitasking, video playing and gaming brining a strong performance from this compact rugged Smartphone. The 4.5 inch screen is ample for all your viewing needs yet has the advantage of keeping this phone small enough for one handed use. With Dual SIM card slots you can manage multiple numbers and take charge of business and personal life on the one rugged device so no matter where you may be your always just a phone call away. For an outstanding rugged phone with great value for money the Ken Xin Da W6 is a tough act to follow. Looks great and works good, no more or less. Strong and light weight.